One of the most fundamental applications of a transistor is using it to control the flow of power to another part of the circuit -- using it as an electric switch. 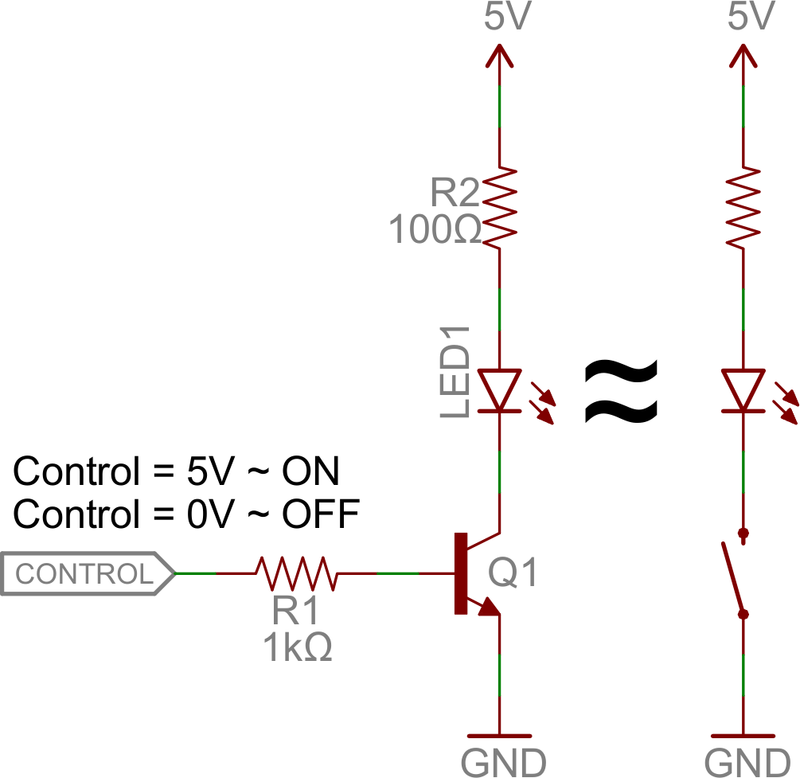 Driving it in either cutoff or saturation mode, the transistor can create the binary on/off effect of a switch. 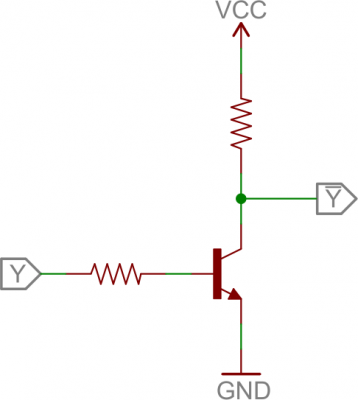 Transistor switches are critical circuit-building blocks; they're used to make logic gates, which go on to create microcontrollers, microprocessors, and other integrated circuits. 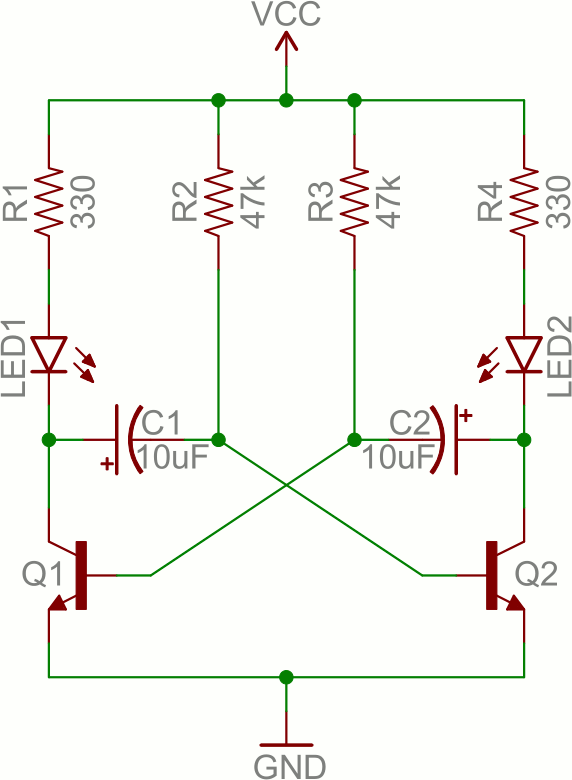 Below are a few example circuits. When the voltage at the base is greater than 0.6V (or whatever your transistor's Vth might be), the transistor starts saturating and looks like a short circuit between collector and emitter. When the voltage at the base is less than 0.6V the transistor is in cutoff mode -- no current flows because it looks like an open circuit between C and E.
This circuit works just as well as the NPN-based switch, but there's one huge difference: to turn the load "on", the base must be low. This can cause complications, especially if the load's high voltage (VCC being 12V connecting to the emitter VE in this picture) is higher than our control input's high voltage. For example, this circuit wouldn't work if you were trying to use a 5V-operating Arduino to switch off a 12V motor. In that case, it'd be impossible to turn the switch off because VB (connecting to the control pin) would always be less than VE . You'll notice that each of those circuits uses a series resistor between the control input and the base of the transistor. Don't forget to add this resistor! A transistor without a resistor on the base is like an LED with no current-limiting resistor. Recall that, in a way, a transistor is just a pair of interconnected diodes. We're forward-biasing the base-emitter diode to turn the load on. The diode only needs 0.6V to turn on, more voltage than that means more current. Some transistors may only be rated for a maximum of 10-100mA of current to flow through them. If you supply a current over the maximum rating, the transistor might blow up. 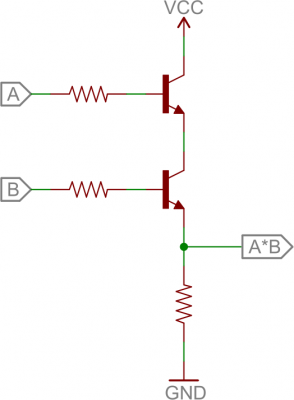 The resistor needs to be large enough to effectively limit the current, but small enough to feed the base enough current. 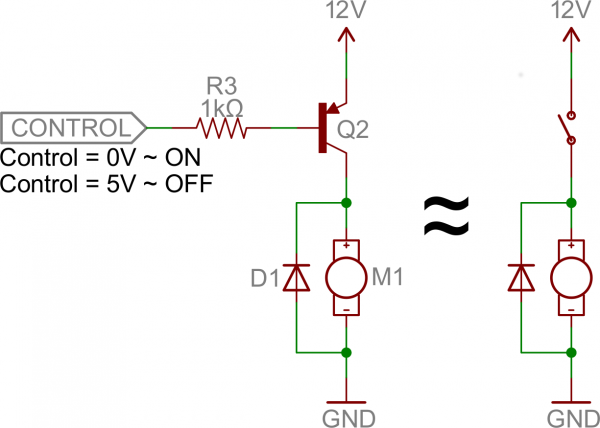 1mA to 10mA will usually be enough, but check your transistor's datasheet to make sure. Transistors can be combined to create all our fundamental logic gates: AND, OR, and NOT. An inverter built out of transistors. 2-input AND gate built out of transistors. 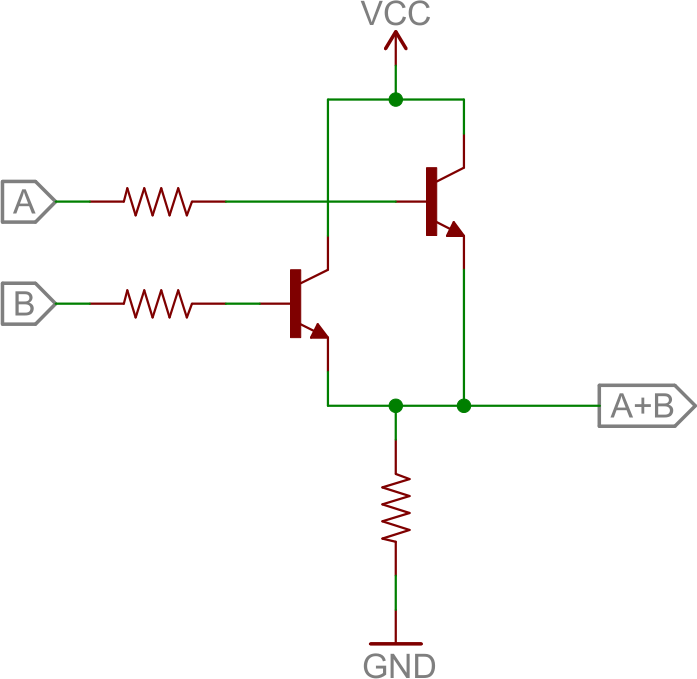 If either transistor is turned off, then the output at the second transistor's collector will be pulled low. If both transistors are "on" (bases both high), then the output of the circuit is also high. 2-input OR gate built out of transistors. 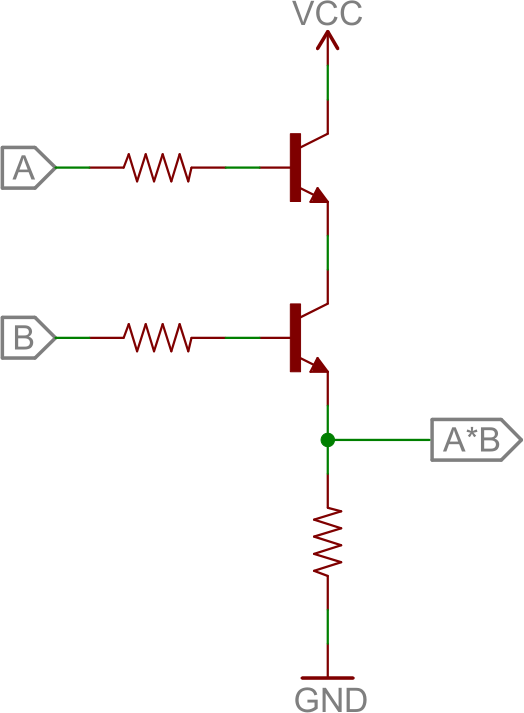 In this circuit, if either (or both) A or B are high, that respective transistor will turn on, and pull the output high. 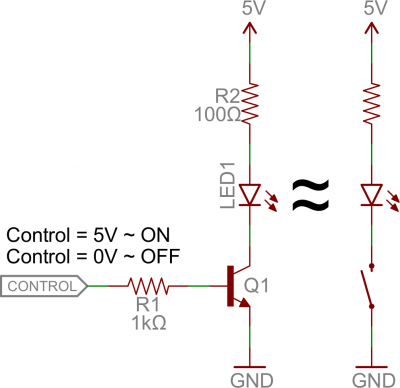 If both transistors are off, then the output is pulled low through the resistor. An H-bridge is a transistor-based circuit capable of driving motors both clockwise and counter-clockwise. It's an incredibly popular circuit -- the driving force behind countless robots that must be able to move both forward and backward. Can you guess why it's called an H bridge? If both inputs are the same voltage, the outputs to the motor will be the same voltage, and the motor won't be able to spin. But if the two inputs are opposite, the motor will spin in one direction or the other. An oscillator is a circuit that produces a periodic signal that swings between a high and low voltage. Oscillators are used in all sorts of circuits: from simply blinking an LED to the producing a clock signal to drive a microcontroller. There are lots of ways to create an oscillator circuit including quartz crystals, op amps, and, of course, transistors. Here's an example oscillating circuit, which we call an astable multivibrator. By using feedback we can use a pair of transistors to create two complementing, oscillating signals. Aside from the two transistors, the capacitors are the real key to this circuit. The caps alternatively charge and discharge, which causes the two transistors to alternatively turn on and off. If Q1 is on, then C1's left plate (on the schematic) is connected to about 0V. This will allow C1 to discharge through Q1's collector. While C1 is discharging, C2 quickly charges through the lower value resistor -- R4. Once C1 fully discharges, its right plate will be pulled up to about 0.6V, which will turn on Q2. At this point we've swapped states: C1 is discharged, C2 is charged, Q1 is off, and Q2 is on. Now we do the same dance the other way. Q2 being on allows C2 to discharge through Q2's collector. While Q1 is off, C1 can charge, relatively quickly through R1. Once C2 fully discharges, Q1 will be turn back on and we're back in the state we started in. It can be hard to wrap your head around. You can find another excellent demo of this circuit here. So, with the values for caps and resistors set to 10µF and 47kΩ respectively, our oscillator frequency is about 1.5 Hz. That means each LED will blink about 1.5 times per second. As you can probably already see, there are tons of circuits out there that make use of transistors. But we've barely scratched the surface. 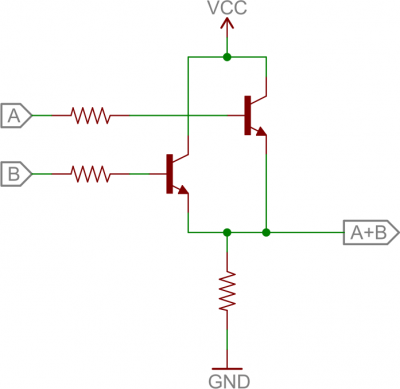 These examples mostly show how the transistor can be used in saturation and cut-off modes as a switch, but what about amplification? Time for more examples!